We’re already a week into December, and if you’re not in the holiday spirit yet, we can help with that. There are plenty of awesome events taking place in the next seven days that range from Christmas Markets to festive lighting displays that will have you feeling merry before you know it. -It’s time for a Tiki Fiesta at Taco Guild restaurant in Phoenix. New tiki inspired cocktails will be served along with great tacos. Dress up in tiki-themed gear to receive half off the drink specials for the night. This amazing deal starts runs from 2 pm till 11pm, so there’s no excuse not to take advantage. 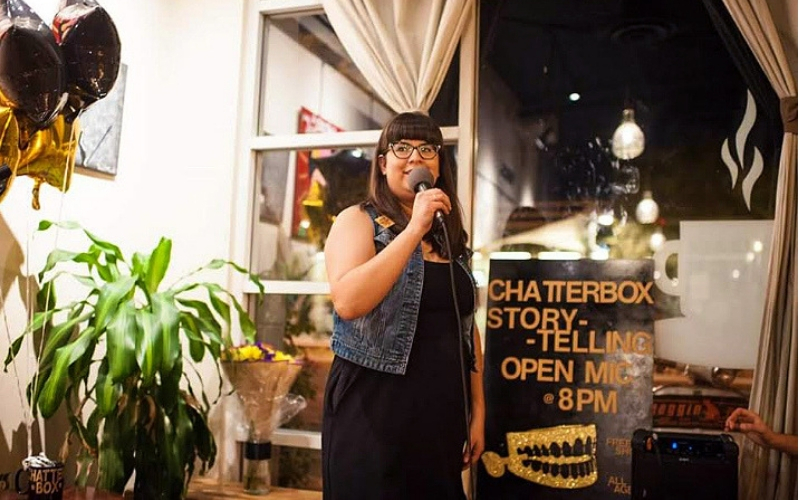 -Hear members from the community tell their six to eight minute personal stories based around a monthly theme (this month’s is identity) over at Fair Trade Café as a part of the Chatterbox Storytelling Open Mic. The event is free and starts at 8:00pm (7:30pm if you want to sign up to perform). -Shop for local gifts and enjoy a festive Christmas Market with the 9th Annual Phoestivus celebration. The market is inspired by famous markets in Germany as well as Seinfeld’s Festivus with more than 150 local vendors, along with live music and a “Hipster Santa.” The festivities run from 5-10pm and admission is free. -The holiday lighting season is underway, and Glendale Glitters is the largest free lights display in the state with over 1.6 million lights to enjoy. This weekend is “Holiday Weekend,” where you can enjoy live entertainment, music, and shop vendors set up in the square. Admission is free and the night runs from 6-10pm, so don’t miss out on a night of fun for all ages! -FilmBar is featuring “The Star Wars Holiday Special” with support from Zia Records with sometimes at 8pm and 10:30pm. Enjoy the outer space variety show that is an embarrassment to George Lucas (but fun to watch and laugh at), with tickets on sale for just $12. -Celebrate Christmas AZ State Fair Style with “Christmas Fever 2018” hosted by the Abaka Foundation, who helps low income families by sponsoring children with a good education. There will be live bands, food and drink vendors, carnival games, and much more to enjoy. There’s no cost for entry, but tickets for food, drinks, and games are available for purchase in advance. Running from 9am-8:30pm, there’s no way your excuses will work for missing this one. -Head over to Heritage Square Park in Downtown Phoenix from 10am- 4pm to not only enjoy the weather but also to shop from over 100 local vendors during the “Hello Handmade” Market. With free admission, this is the perfect time to #ShopLocal and check off last-minute items from your Christmas shopping list all at the same time. -It’s Sunday night, which means it’s time for trivia over at the Crescent Ballroom. Test your knowledge from 5-8pm for your chance to win a variety of prizes, all while enjoying food and drink specials. -Hang out at The Lunchbox in Phoenix from 7-11pm for the “Ugly Sweater Affair,” a night featuring local music and art. The show will feature several performances and is a great excuse to wear your ugly sweater. Plus, tickets are only $5 in advance (or $7 the day of the show). -Desert City Jazz is making their debut at the Nash Jazz club at 7pm, and you don’t want to miss it. The LGBT and Ally Jazz Ensemble is directed by Michael Collier and will feature original compositions and familiar tunes as well. Tickets are $20, or $15 for seniors and students with ID. -Drive through the Illumination Symphony of Light display over at Diablo Stadium in Tempe from 6-10pm to get yourself in the Christmas spirit. Over 1.7 million lights are on display and set to be in sync with your car’s radio, so you can enjoy the site from the comfort of your car! Ticket prices vary; you can find more details on their site. -It’s a special Festivus edition of Seinfeld Trivia over at Valley Bar, starting at 7pm. Free to register – so test your knowledge and treat yourself to a little friendly competition to get you in the holiday spirit. -Let’s be honest: the music from The Greatest Showman is addicting. So why not enjoy the film at the Alamo Drafthouse, but in Sing-Along format? Subtitles will be provided for all of the songs, so get there and belt it out! The feature starts at 7:30pm, and tickets are $16.22! What events are you most looking forward to for this week? Tag us on social with #PhxFray and #FrayLife and comment below so we can follow along in the fun! If you’re just really struggling with the whole holiday spirit thing, maybe some actual spirits will do the trick. While there’s still time, make sure to check out these most festive bars!